The hubs and I both had iPhone 3s in Otterbox cases, and when my hubby was in Atlantic City on business (same day we had an earthquake, which we never have here!) he dropped the phone, and it landed just right to crack the screen. I managed to find him a kit on Ebay to replace it, and it broke again shortly after. I really didn’t want him to be without a phone going back & forth to work until we tried to fix it again, so we ended up upgrading to the 4S and again, bought Otterbox cases. He managed to fix the old phone (sorta) and we gave our old phones to the kiddos to play games. All went well until I scooped one up with bedding & threw it in the washing machine. We realized it almost immediately, but the damage was done. The Otterbox Commuter cases were OK, and their customer service was great in replacing both of our cases when they cracked in the same place. I didn’t open my replacement, figuring I’d wait until I really had to replace it, since I was coming to the end of the warranty. The Lifeproof cases were a lot more expensive than the Otterbox, but I thought about how much money we spent on replacement screens (and the paperweight that was our drowned iPhone3) and figured it was worth it. They are pretty similar in size and thickness, though the Lifeproof is a bit longer since it has a bigger area at the bottom. The cases come with a 90 day warranty, and if you register your case, it’s extended to 1 year. Make sure you register your case FIRST before you install it. You will need serial #s on both sides of the case. You have to complete a quiz (which proves you read the instructions) and enter these #s. We didn’t do this first, and still haven’t brought ourselves to take them apart & get the #s. So save yourself the time and do it first!! The cases are designed to be completely water-tight if installed correctly, and have a built in screen protector. The case comes with a plug for the headphone jack, as well as an extender and an extra plug (hooks to the extender for safe keeping) which I didn’t immediately realize when I was looking at the site. I didn’t realize how non-air, dirt etc. tight the Otterbox was until I took it off to install the Lifeproof. Fortunately, the Lifeproof also comes with a cleaning cloth!! After you follow all of the instructions, including performing the water test (without the phone), you are ready to install. It’s super easy. The case has tons of extra features that you may not notice at first, like protecting the volume buttons. It’s pretty slick looking when it’s on, and the edge has just enough grip, while the rest of the case slides in & out of pockets easily. The iPhone headphones work fine, while you might need to use the extender for thicker headphone jacks. The standard iPhone charger works perfectly as well (there is a flap to make it waterproof when not being charged.) There is an optional extender to make the case work with speaker docking stations etc. The phone works perfectly, with no change to the touch screen or sound. Bonus, we put the cardboard iPhone screen in our old Otterbox cases and our kids are having a blast playing with them! 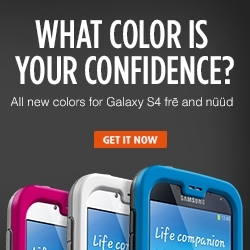 Get 15% off all orders at LifeProof.com with coupon code LUCKY through 3/18/13! I purchased the pictured items myself. Post contains affiliate links however, I was not compensated for this post, and all opinions are my own. Although you have a pretty thorough review I’d like to add my input. I bought my Lifeproof case a little over a year ago for my iPhone5 and it very “baby proof”, just not “life proof”. Although it’s designed to withstand water, mine was slightly under water for a fraction of a second and has caused major malfunction to my phone which they will not cover under their “warranty”. Actually they take no responsibility for any of it. Also, talking on the phone is almost pointless due to the speakers being covered. Anyone I’ve known who owns this case claims they have the same problem. You’re muffled and sound distant to whom you talk to and almost have to tell into the phone. A pleasant conversation is out of the question though. Oh no! I haven’t gotten mine wet thankfully but we had bought a Lifeproof case for my son’s iPad. He immediately lost all the rubber pieces for it, then intentionally poured water on it “to see.” (sigh) The microphone no longer works & the sound/headphone jack is wonky but it otherwise works. I’ll have to be really careful with mine. There are actual baby cases made for iphones/itouch. I just discovered them at Target last night. $15 or less I think. I can’t remember the brand. This review is fantastic! Thank you for sharing! I need to look into one of these…my youngest thinks my phone is a teething toy.